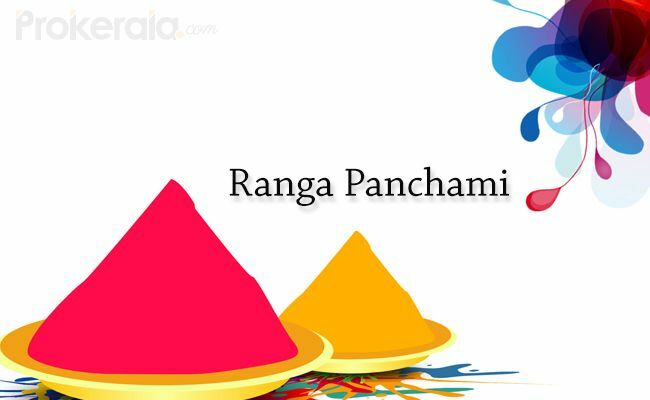 Ranga Panchami is a Hindu festival celebrated just five days after the colourful festival of Holi. It is observed on the ‘Panchami’ (5th day) of the Krishna Paksha (the waning phase of moon) during the ‘Phalgun’ month of the Hindu calendar whereas in the Gregorian calendar this occurrence corresponds to the months of February-March. Ranga Panchami is also celebrated in a colourful manner that is marked by throwing ‘gulal’ (red fragrant powder) and splashing of colored water. The word ‘Rang’ signifies ‘color’ while ‘Panchami’ refers to the 5th day and henceforth in some places across the country, Holi is also played on Ranga Panchami. According to the Hindu mythology, Ranga Panchami is symbolic of victory over ‘raja-tama’, which is the barrier to spiritual advancement. It is celebrated with full fervour in the states of Madhya Pradesh, Maharashtra and some regions of North India. In Maharashtra it is celebrated as ‘Shimgo’ or ‘Shimga’ and is characterised by the traditional Palkhi dance. It is observed mainly by the members of fishing community and involved dancing, singing and merry-making. In temples of Vrindavan and Mathura, the celebration of Rang Panchami culminates the festivities of Holi. The celebrations of Rang Panchami resemble much like Holi. This day is marked by playing colors with friends and families. On this day Hindu devotees also worship Lord Krishna and Goddess Radha. They perform puja rituals to pay homage to the divine unison between Krishna and Radha. Ranga Panchami is a joyous festival that is celebrated in all corners of the country. Occurring just after Holi, this festival is also marked with colors, fun and frolic, much like Holi. Ranga Panchami holds immense religious significance for Hindus. As per the legends it is believed that ‘Holika Dahan’ or the fire that shines brilliantly during Holi putrefies all the raja-tama particles that are present in the atmosphere. It renders a pure aura in its surroundings and charges the atmosphere with tremendous positivity. This ceremony also invocates several deities through the medium of colors. It is therefore considered that the festival of Ranga Panchami frees all the raja-tama. There is another perspective to Ranga Panchami celebrations. The main objective of this festival is to activate the ‘Panch Tatva’ or the five elements that make up the universe. These five elements constitute of earth, light, water, sky and wind. It is considered that the human body is also made of these five elements. The festival of Ranga Panchami invokes these five basic elements that help to restore balance in life.